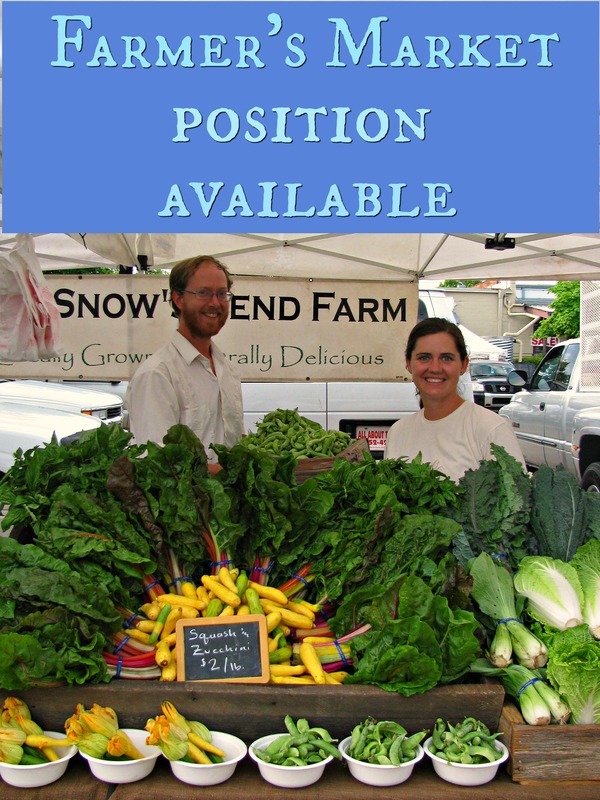 ​Download, complete, and email job applications to margaretann@snowsbendfarm.com. $12/hour plus all the produce you can eat! Snow's Bend Farm is a Certified Organic, family farm just outside of Tuscaloosa, Alabama. We currently grow 50 different fruits and vegetables (many varieties within those), cut flowers, herbs, as well as raising pastured pork. All farm products are directly marketed to Birmingham and Tuscaloosa through our 200+ member CSA, 2 farmer's markets, and to 15 restaurants..
​The farm assistant is active in all aspects of crop production as well as being responsible for CSA deliveries, restaurant deliveries, and vending at farmer’s markets. We will fully train all employees and ensure that they are comfortable with their responsibilities. Ability to handle the many physical challenges such as lifting up to 50 lbs. regularly, standing for long periods of time, bending at the knees and back, etc. Works closely with farm owners (David and Margaret Ann Snow), farm manager, and other farm workers (a mix of full-time, H2A workers, and summer interns). Once well trained will be given sole responsibility of some tasks. The farm manager is active in all aspects of crop production as well as being responsible for CSA deliveries, restaurant deliveries, and vending at farmer’s markets. The farm manager will also lead the crew in harvest, washing, and packing the produce, as well as transplanting and other field tasks. We will fully train all employees and ensure that they are comfortable with their responsibilities. Works closely with farm owners (David and Margaret Ann Snow) and other farm workers (a mix of full-time, H2A workers, and summer interns). Once well trained will be given sole responsibility of some tasks. Farm workers are involved in all aspects of the farm, including crop production (planting, maintaining, harvesting, washing, and packing), CSA and restaurant deliveries, and vending at farmer’s markets. Applicants should know that we are a working farm with a strong focus on productivity, efficiency, and getting things done. Works closely with farm owners and other farm workers. In the spring, early summer, and fall months there are typically up to 60 hours available and a minimum of 40 hours required. There is a slight dip in available hours in the peak heat of summertime, but still at least 40 available. In the winter, there is typically 40 hours, but some weeks the weather can have an effect on those. However, we grow and sell year-round so there is not a significant drop. Access to loads of high quality, delicious produce. ​Ideally, when someone new comes to work on Snow's Bend we would like for it to be the beginning of a 3-year track, longer would be even better! The first year would be an introduction to our farm and farming systems. In the second year, more responsibilities would be given, and in the third year full management responsibilities of some areas would be handed over. With this in mind, everyone begins as an intern or crew member, but there is plenty of room for growth and performance-based pay increases.